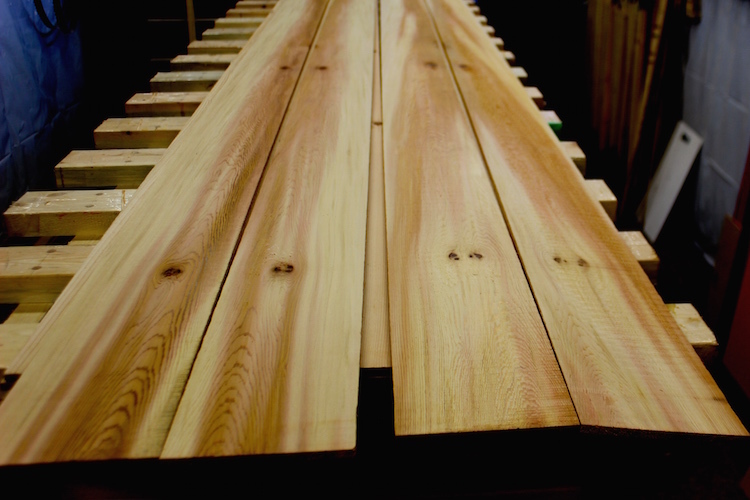 Western Red Cedar is an amazing wood for building wood SUPs because it is light weight, reasonably strong, and smells great while you are building the board. Many of the other light weight wood choices are very uniform in colour but Red Cedar’s variations are truly amazing. I use the colour variations to create the accent stripes and special features makeing each board truly unique. The really dark stripes and the wide panels on the panels above illustrate the colour range of Red Cedar quite well. 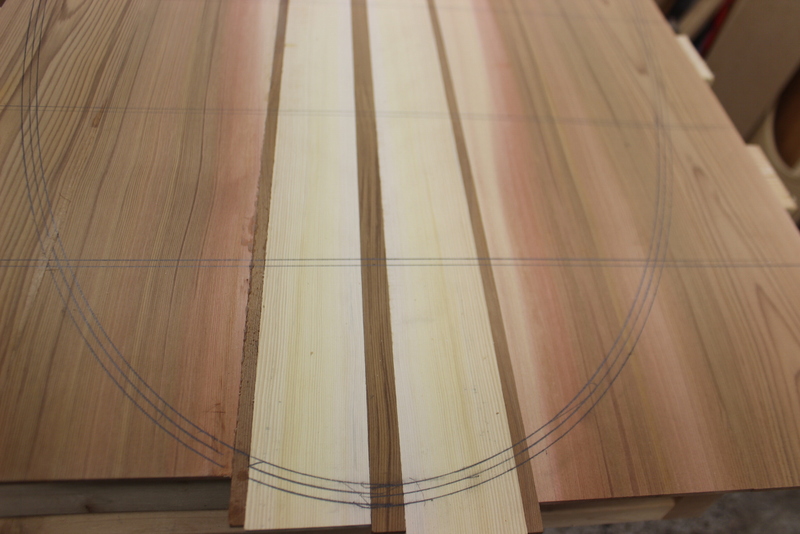 This is all Red Cedar except for the Yellow Cedar pin stripes. The wide panels shown on this page were all made from 2×6’s and 2×8’s that were sawn into 1/4″ planks. The board above was made from a 2×12 that was first cut into two 2×6’s. 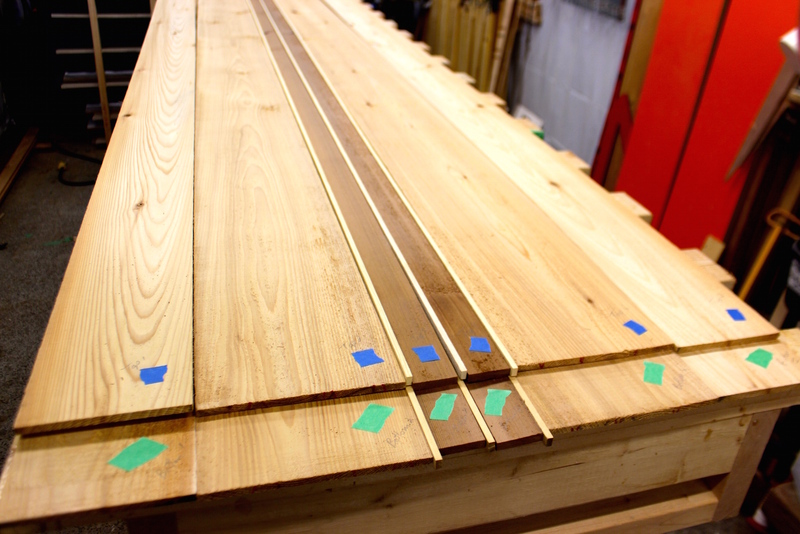 I use Yellow Cedar sparingly on my boards because it is heavier than Red Cedar. Yellow cedar has almost no visible grain making dramatic contrasts possible when you have wild grain like on the board above. Epoxy will greatly intensify the colour variations that are visible at this stage. If you want a preview of what the finished board will look like you can wet a rag with denatured alcohol and give the planks a wipe. The alcohol evaporates quickly and leaves no residue. Panels with variations like the book-matched planks above will be quite spectacular when finished with epoxy.